WTI crude prices have returned to the vicinity of $51.50/b after yesterday’s decline. WTI opened at $51.39/b today, a drop of $1.13 from yesterday’s opening price. 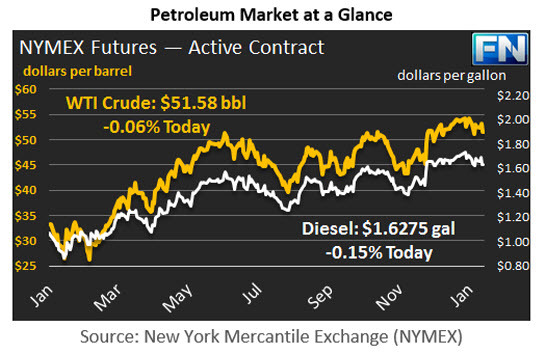 Prices yesterday even dipped below $51/b for a time. 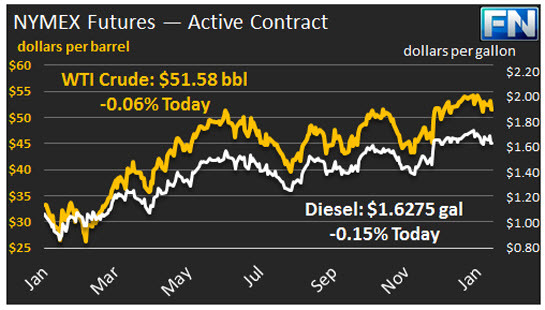 Current prices are $51.58/b, $0.50 above yesterday’s close. Yesterday’s downturn was in response to new forecasts of expanded crude supply, particularly from the U.S. The EIA released its estimate that crude production from the seven main shale plays will rise from 4707 kbpd in January 2017 to 4738 kbpd in February 2017, an increase of 41 kbpd. OPEC added another 23 kbpd to its forecast of year 2017 average U.S. production. OPEC now forecasts that U.S. production will be 13.7 mmbpd in 2017, versus 13.6 mmbpd in 2016. One year ago, in January 2016, OPEC estimated U.S. production at 13.9 mmbpd, and it forecast that production would fall to 13.5 mmbpd in 2016. OPEC reported that it cut its December by 220.9 kbpd, dropping from 33,305 kbpd in November to 33,085 kbpd in December. The markets had a lukewarm response, since OPEC had noted that the U.S. increases could undo some of what the production cut intended to achieve. The IEA noted that it was too soon to assess the levels of OPEC compliance. Distillate opened at $1.6199/gallon in today’s session. This was 2.87 cents below yesterday’s opening price. Current prices are $1.6275/gallon, up by 1.83 cents from yesterday’s close. RBOB opened at $1.5416/gallon today, down 6.1 cents from yesterday’s opening. Prices slid to $1.5502/gallon today, up 0.15 cents from yesterday’s close.